We have developed an annotated list of masters and mistresses that shared our lives during the many decades of the school's existence. Additional images from the school photographs will be added during coming months. >> Ian Butterworth, who was a master at JRGS/JRHS from 1963 to 1980. >> Anne Smith, who was with the school and SFC from 1970 to 1999, as Senior Mistress, Deputy Head and Principal. >> Cliff Cummins, a pupil at the school from 1956 to 1962, who found many dates at the Family Records Centre. >> Paul Graham, a pupil at the school from 1959 to 1966, who located additional details in a variety of sources. 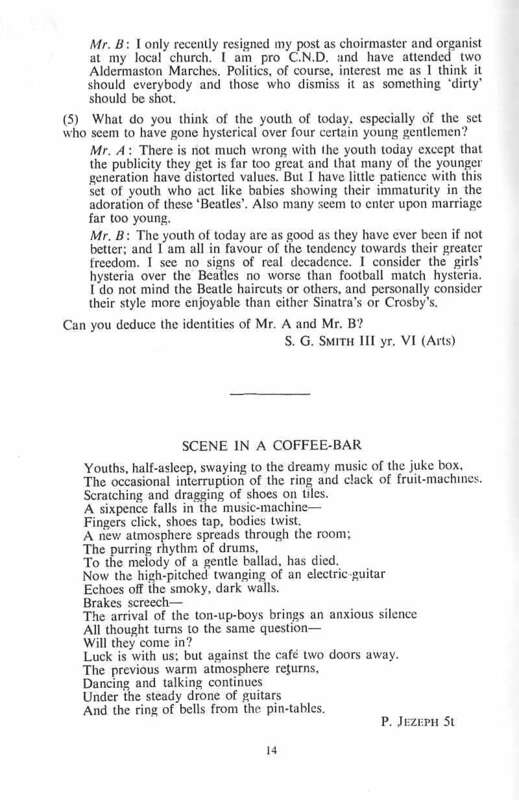 >> Anthony Childs, a pupil at the school from 1947 to 1953, who updated a number of individual entries. 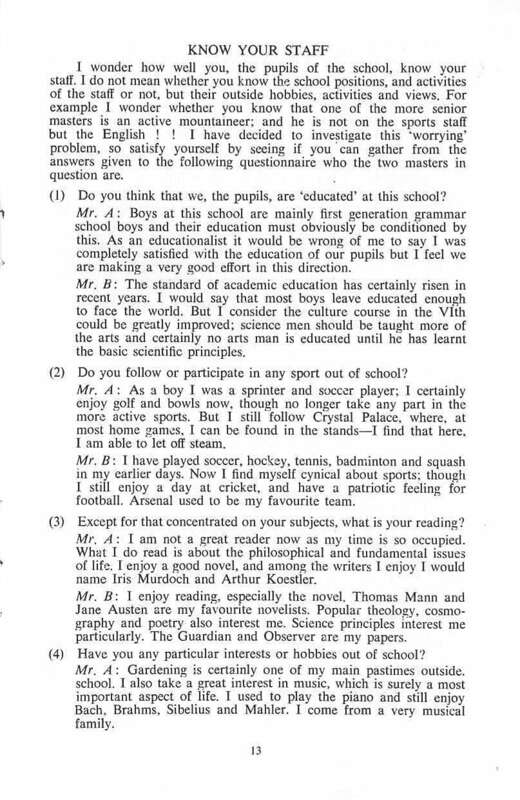 >> Tony Almond, a pupil at John Newnham school from 1957 to 1961, who recalls former master Charles Myers. >> Keith Hunter, a pupil at the school from 1968 to 1975, who recalls his first-year form master A. Robin Wilkinson. >> Peter Hurn, a pupil at the school from 1967 to 1973, who recalls several teachers from the late-Sixties & early-Seventies. 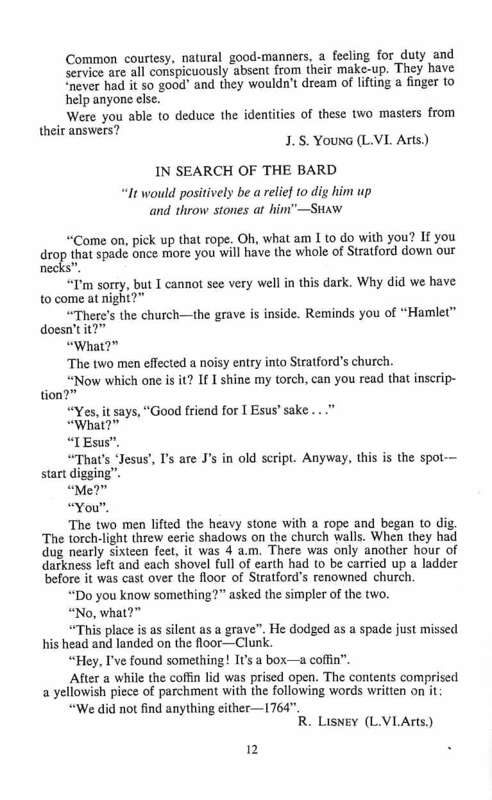 >> James Barter, a pupil at the school from 1970 to 1973, who recalls several teachers from the early-Seventies. 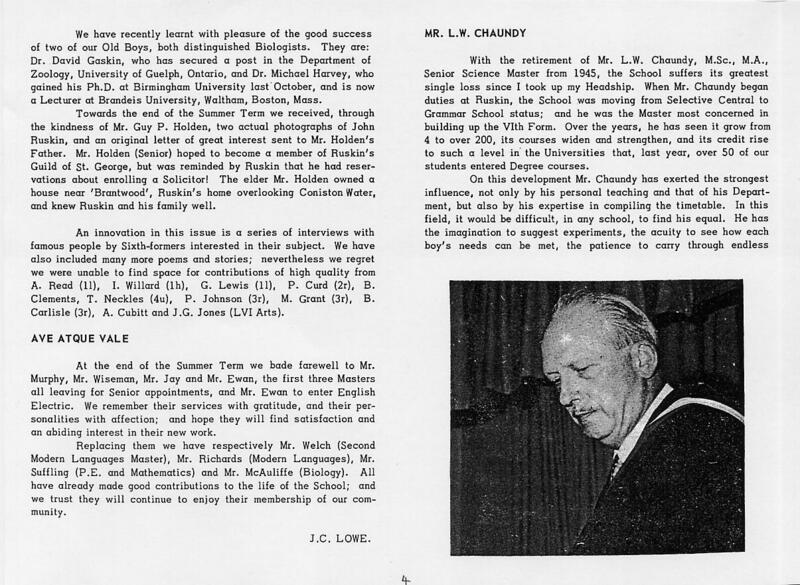 As Paul Graham (JRGS 1959-66) points out: "It is fascinating to think that 11 of these masters were still teaching at John Ruskin Grammar School 10 years later in 1965, and that two others - Mr. Neale and Mr. Richardson - stayed until about 1960. The continuity of such a senior core of staff must have contributed to the increasing prestige of JRGS during the decade after the move to Shirley from Central Croydon." Click in the image to view a larger version of Mike Marsh's vintage photograph. 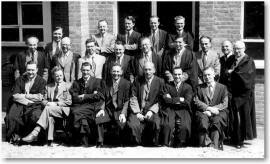 Back row (left-to-right): Mr. Warne (1953-59), Mr. Hancock (1947-65), Mr. Culcheth (1955-57), Mr. Wright (1953-59), Mr. Clark (1954-58); Middle row: Mr. Basil (19??-?? ), Mr. A. Murray (1952-77), Mr. Lawes (1953-56+), Mr. D. Rees (1952-72), Mr. G. Richardson (1949-60), Mr. Neale (1953-59), Mr. Gee (1945-71+), Mr. Smith (1942-78), Mr. Peacock (1948-71+); Front row: Mr. Whellock (1946-56), Mr. Pearman (1936-69), Mr. Cracknell (1936-76), Mr. Lowe (1945-73), Mr. Chaundy (1945-69), Mr. Fisher (1951-56+) and Mr. Pearce (1944-70). 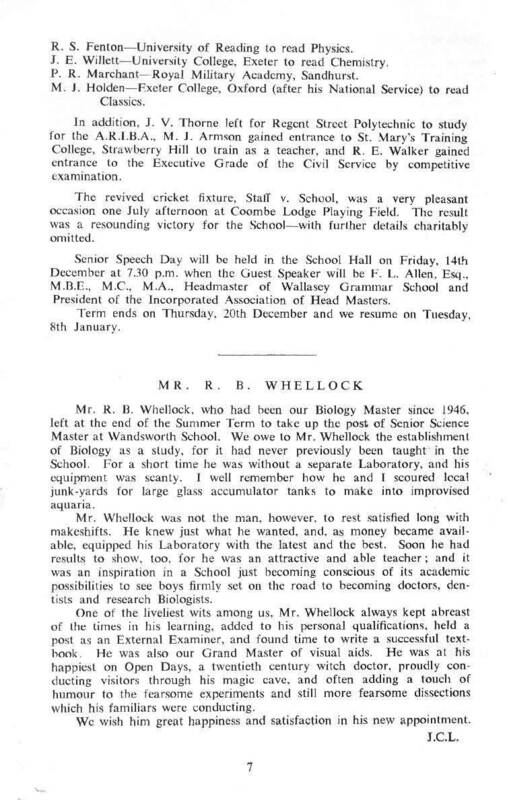 Mel Lambert (JRGS 1959-65) adds: "William Cracknell was with the school for an astonishing 40 years; Charles Smith 36 years; Leonard Chaundy 34 years; George Pearman 33 years; John Lowe 27 years; Vincent Gee at least 26 years; Ronald Pearce 26 years (a sad death indeed); Alan Murray 25 years; Charles Peacock at least 23 years; David Rees 20 years; and Joseph Hancock 18 years." Re-established a secondary school - and eventually a junior school - as a Christian Foundation. According to John Peet (2007): "His wife, Heather, was a tremendous support to him in his school and camp and Crusader work." Died 17 May 1970 in Bedfordshire. 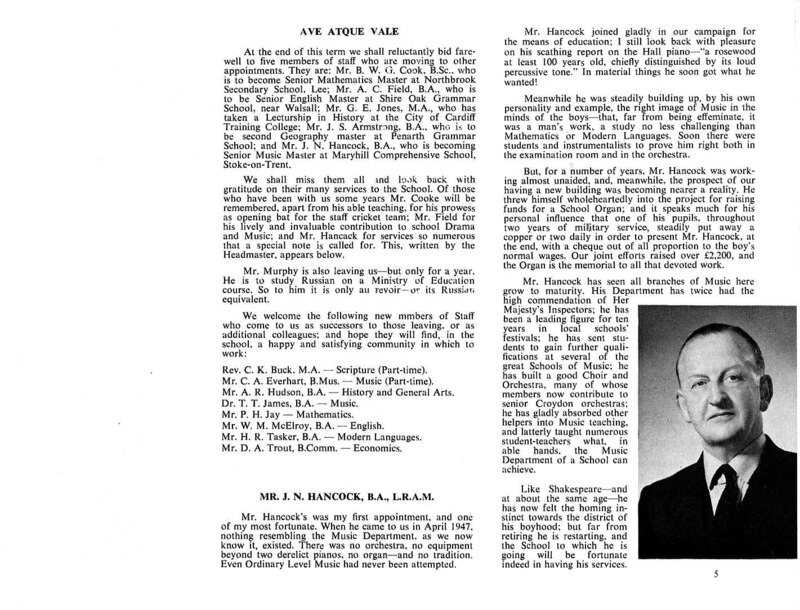 "A meticulous teacher, firm disciplinarian, a man of independent but fair judgment," wrote Mr. Lowe in 1971 school magazine. L J Burtenshaw FTCL. DSCM. Head of Music Department in 1979. Also Director of the Croydon Schools Music Centre. Helped set up Sixth Form. 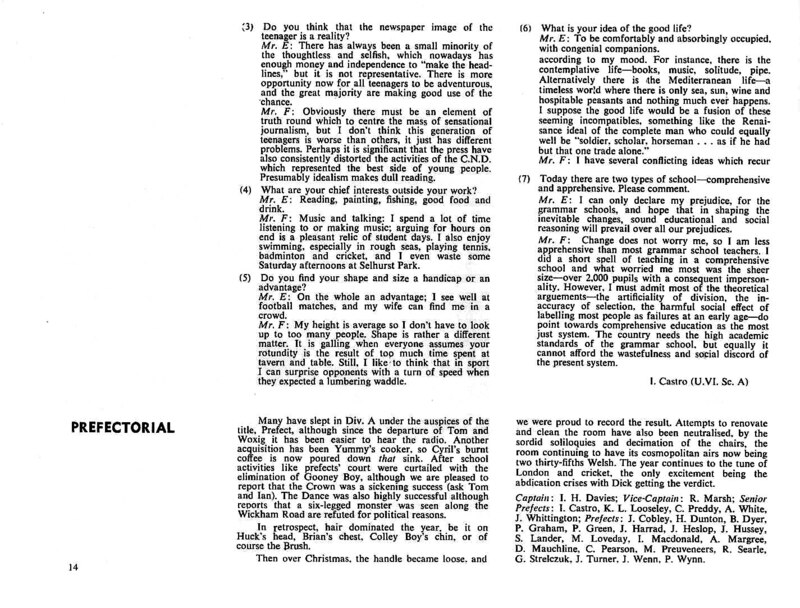 Recalled in May 1969 magazine, page 4 and 5. Jan 1920, as one of seven founding teachers under the first headmaster, William Field. The school comprises 210 boys. Born 22 March, 1893 in Mile End. Died 25 Feb 1955, aged 61, in Croydon. Last surviving founding member of original school staff. Born in 1924 in Greenwich, London. Retired and reportedly living in Bromley. Dec 1965 to Northbrook Secondary School, Lee and thence to Warlingham Girls School. Returned later, by Sep 1967. "Know Your Staff: Mr. J"
Died 22 May 2000, age 88. Lived in Great Bookham, Surrey. Retired April 1976, after 40 years. "[but] I wanted to see the school through its last educational development [when JRGS went co-educational + comprehensive]." Studied English at Nottingham University and spent 4 years at Ingram Road Senior School, which became Westwood Girls High School. "[JRGS] is certainly different from the school I joined as very young teacher, but it's every bit as good." Later became head teacher at Archbishop Tenison GS, Croydon. Terence Morris: "He never seemed happy with that [latter] assignment." 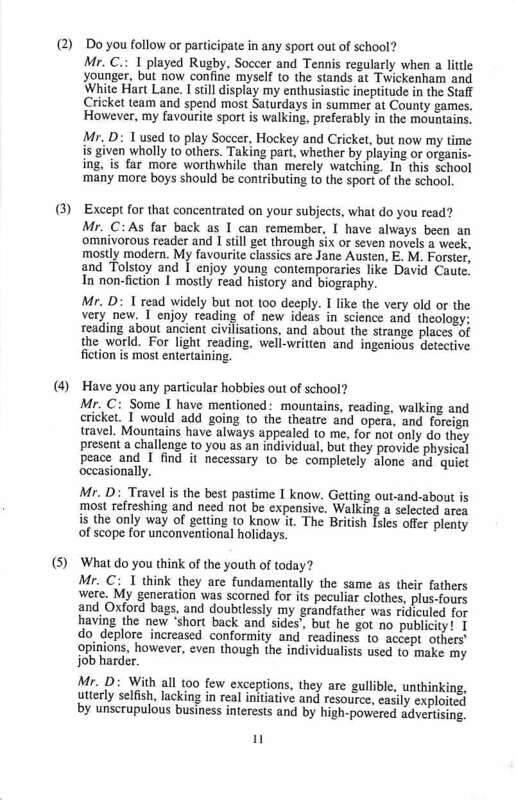 A graduate - like Mr. MacLeod - of King’s College, London. Peter Oxlade: "He was always immaculately dressed and well groomed. He had a quite severe nature and held court in class in the strongest way." Retired "some time in the late-Sixties"
"Know Your Staff: Mr. F"
Born March 1935 in Hampstead, London. Attended St Catherine’s College, Cambridge, graduating in 1956 with a 2II honors degree in English. Attended St Joseph’s Blackpool; left in 1953 with A-Levels in English Lit, French & Latin. 1969: Head of Physics at John Newham High School. 1976: Head of Science at Eltham Green School (ILEA 1760 pupils) Later became Deputy Head. 1992-2001 finished teaching career as Physics and Maths Teacher at Trinity School– "like being back at Ruskin"
His wife Ann taught at Ruskin after he had left. July 1968 to work at English Electric Ltd. Played on staff tennis team. Born 21 Nov 1935, in Brentford, London. Died 14 Dec 1971, aged just 36, in Rotherfield, Sussex. Played organ, choir member, junior school productions, school trips abroad. Bernard A Fisher M.A. L.èsL. Remembered by at least one JRGS Alumnus as being very severe and strict. Image taken in 1969 by a 3U member, Jeremy Moore. Retired from teaching in 1989 and lived in New Zealand. Moved to Perth WA 2003. Born 5 April 1933 in Battersea, South London. Died 17 July, 1989, aged 58 of heart attack, week before he was to retire. Died 7 February 1971, aged 62, according to page 4 of May 1971 school magazine. 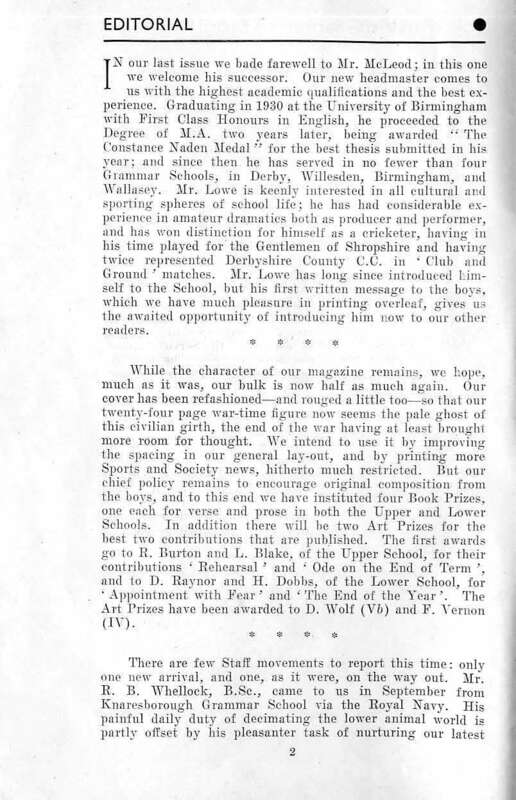 "He came to a school with little musical tradition and few amenities; and with great courage and strength of personality he created what he did not find," wrote Mr. Lowe. 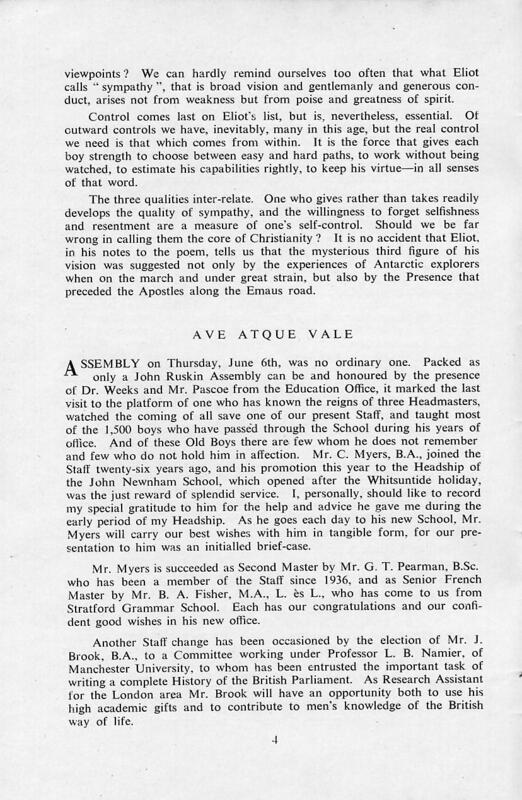 See appreciation on page 5 of the July 1965 School magazine. Died 16th September 2017 "having suffered from dementia." April 1952 to Davidson School, Croydon; later to Ashburton Girls School. Communicant member of St. Michael's Church. According to Brian Thorogood [she] made it quite clear she was to be called "madam." According to Anne Smith: "He had a habit of embracing male ex-colleagues such as John Rowlands in the corridor, to the amazement of students." Made several return visits after he had become white-haired and looked like Father Christmas. Reportedly, conductor of the Berlin Philharmonic Orchestra and appeared on film titles of several mid-Sixties movies. 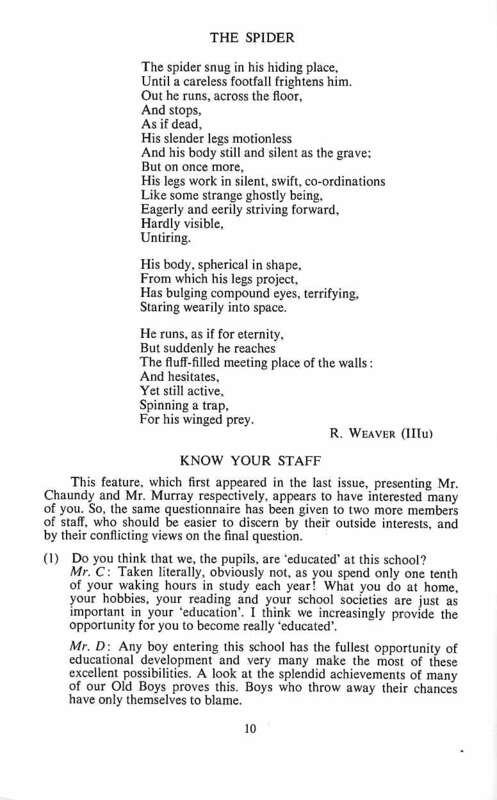 See May 1968 School Mag, page 2, for a tribute to Mr. Kay, described as "one of the most popular member of Staff." 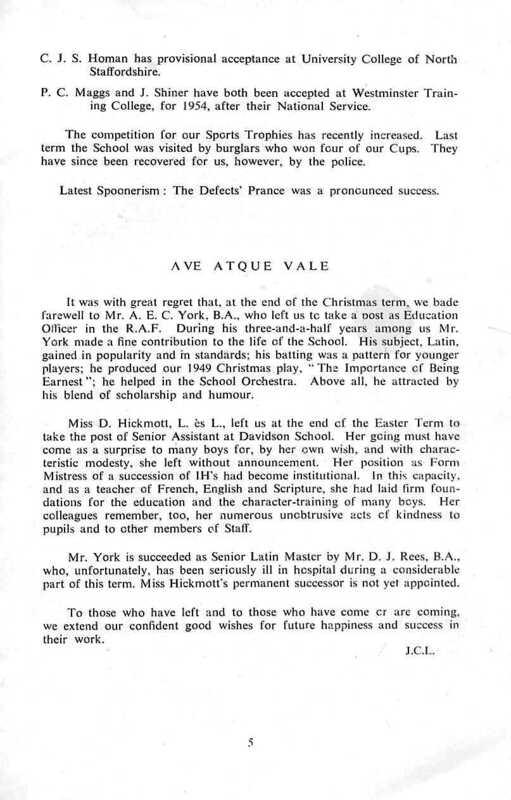 1946, as third JRGS head, after it achieved status as a grammar school in 1945. Born 8 Dec 1909 in Shrewsbury. Died August 1986 aged 75 in Bromley. Retired in July 1973, after 27 years at JRGS. "I can truthfully say that it has been my life and I've wanted no other." Graduated 1930 from University of Birmingham; served at schools in Derby, Willesden, Birmingham and Wallasey. "Iacobus Cornus" or "Hooky Jim"
Also taught World Studies, French and Social Studies when Latin declined. Lost arm in a shell blast prior to Battle of Arnhem in WW2. A very good cricketer and footballer, and star of the staff sides. 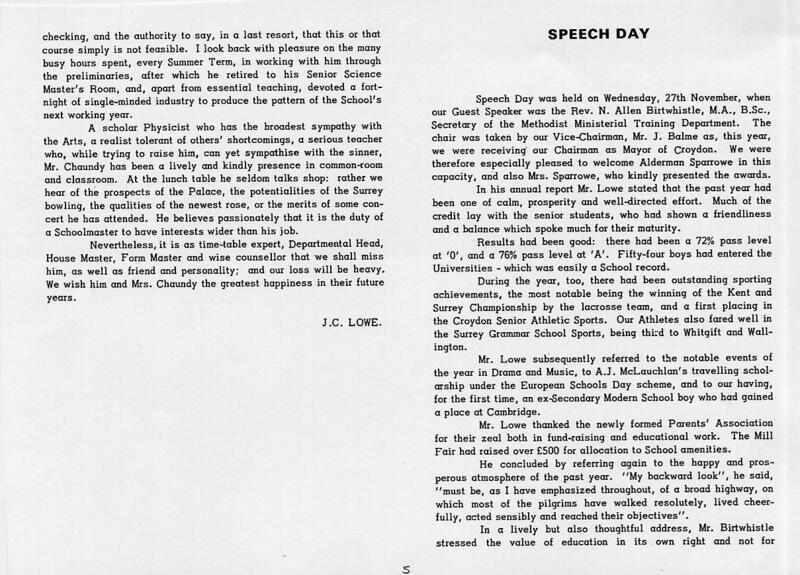 Spring 1951 "after 26 years on staff"
to become headmaster of the newly opened John Newnham Secondary School, Selsdon. 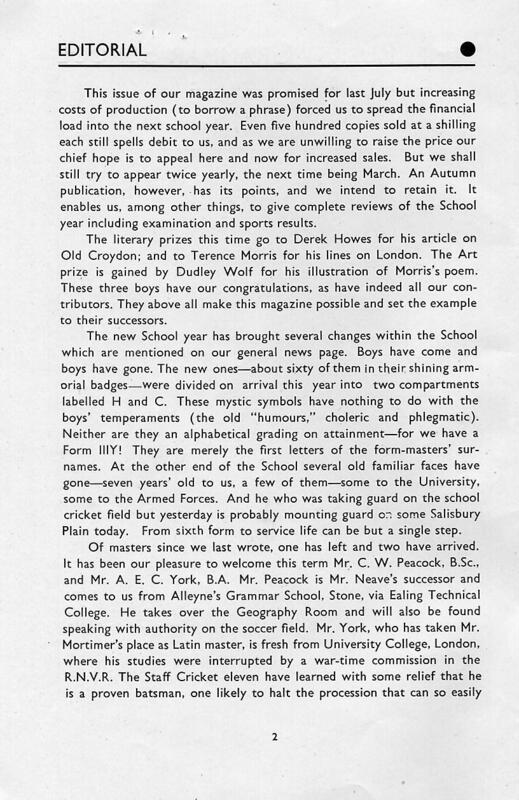 See: Autumn 1951 JRGS magazine page 4/5. 1990, succeeded at Shirley by Anne Smith, who in 1991 became Principal of the John Ruskin Sixth-Form College in Selsdon. Anne Smith: "A county player for rugby and played for the RAF in cricket. (Or I may have got them the wrong way round! Anyway, he was not only a sports lover but also a very good player. According to Anne Smith: "Charles Peacock became blind as a result of his diabetes, but continued teaching." Born 30 October 1908 in Reigate. Died in post, January 12 1970 in Croydon, aged 61. Made Second Master in Sep 1951. Ended up back in school teaching when local Grammar School lost its chemistry master. "Ted" and "Chimp" - "possibly because of his constantly furrowed brow a la chimpanzee." Born 14 June 1908 in Paddington, London. July 1970, to teach in Cyprus but returned after division of the island. According to Roger Adcock, "twisted side burns if you messed about - which 5G did." Born 26 Jun 1920 in Llanelli, South Wales. Born 26 Sept 1936 in Yorkshire. "Golly" but also due to curly hair surrounding bald pate. History Following retirement, lives in Royal Tunbridge Wells and is member at Lords According to Steve Tyler "our paths crossed again at The Oval." Retired from the school - now a Sixth Form College - in July 2009 after 43 years service. Anne Smith: "When it was necessary to develop Business Studies courses, John became a Business Studies teacher too, and was assiduous in learning and presenting these new courses; later he added Accounting to his repertoire." Retired; last heard of in 1998 and 2006 living in Sheffield. Born 8 Octoer 1924 in Wigan. 1999, after 29 years at school. Born 16 November, 1912, in Gosport - a "Hampshire Hog"
Head of PE Department 1943-68. Now in late-Nineties; formerly assisted at Fairfield Halls, Croydon. Reportedly, "a good cricketer who reached club level." Hugh Rendel Tasker BA (Cantab) Cert.Ed. Sep 1955 from Heath Clark School, Croydon. "I made our front door number in his class during my first year" - Peter Hurn. Moved to Canada in 1991, to live with his daughter, Valerie (born 1934), a professional pianist. According Ian Macdonald/Jan 2009: "Via Valerie Tryon's web page, I contacted her UK agent. I was saddened to learn that her father had died in Canada about 10 years ago, having outlived his wife, Iris." A keen sportsman in his youth, playing cricket, rugby and basketball. Staff cricket, school trips abroad, whist drives, school choir. He had lived in Stevenage for 42 years and been a mem-ber of the Rotary Club of Stevenage for over 25 years. Sadly, died 4th Sep, 2015, aged 100, at the Hall Grange Methodist care home, Shirley. "The architect designed the Biology Department and the garden and the pond all around my requirements." August 1967, to return to New Zealand. Retired and now living in Lancaster. Born 28 June 1919, in Eastbourne, Sussex. Died 1998 age 78, in Broadstairs, Kent. According to Brian Thorogood "committed member of School ACF, working hard on a course to obtain the rank of Lieutenant." Staff cricket - "a proven batsman" Also played on staff tennis team. 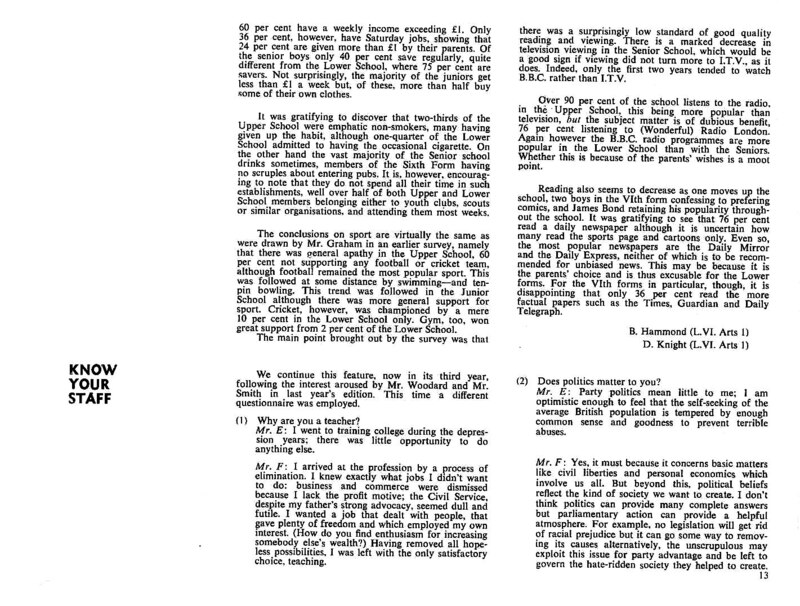 According to Oct 1948 school magazine studies at UCL interrupted by wartime commission in RNVR.